Multipurpose Drupal Commerce theme with lot of features can be easily customized and give your site unique design! 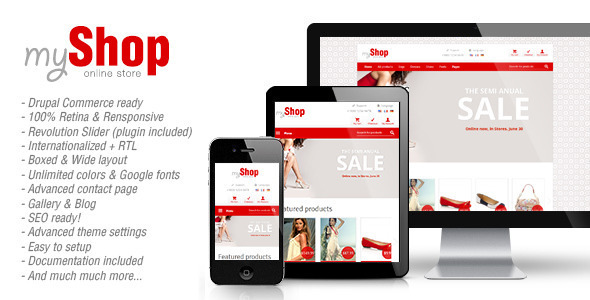 myShop theme can easily adapt with your business as it grows or explores new models. Supports product displays, order management, line item, payment method API, paypal ready, Tax calculation / VAT, Discount pricing support and much more. This theme can be used with boxed layout or full width layout. You can also choose lot of options for every part of site you see. Choose fonts for menu, body text and headings. Choose between backgrounds images, colors, patterns etc.